Our friends at Newcastle Theatre Company have been working hard on an exciting new production that will appeal to readers of crime novels. 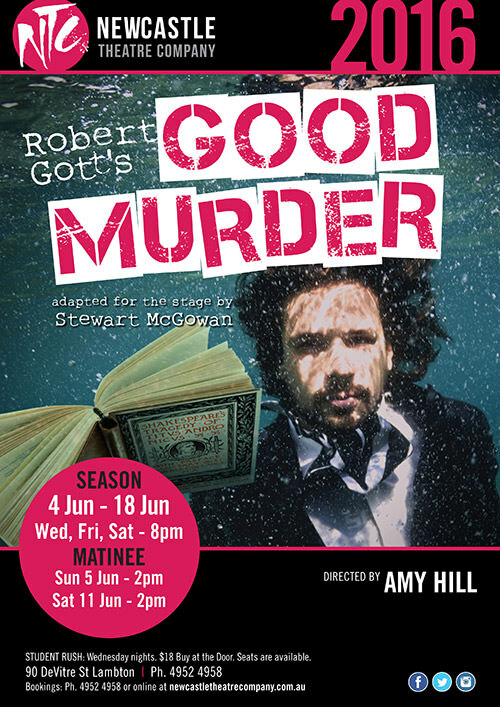 Local theatre stalwart Stewart McGowan has adapted Melbourne writer Robert Gott’s clever crime-caper novel Good Murder for the stage. The company has generously offered to raise funds for the festival at a special preview performance at 8pm on Friday, 3 June, at 90 De Vitre St, Lambton. Robert Gott will be a special guest on the night. Come along and enjoy a fantastic night of theatre! Robert Gott will speak, there will be drinks and merriment, and the festival’s program development will benefit from ticket sales. Good Murder is one of Gott’s four crime-caper novels set in 1940s Australia, featuring “dickhead detective” and masterful comic creation William Power. Tickets are $30 and $24 concession. There are discounts for group bookings.